The first divided highway between the east San Gabriel Valley and the Pomona Valley was built in 1934. It was called Arroyo Avenue, and was designated as part of U.S. Highway 99. In 1957, US-99 was widened and became the San Bernardino Freeway, and when it was added to the Interstate Highway System in the early 1960s, it became what we know today as Interstate 10 (I-10). In these views, we are looking east toward Pomona just west of the highway's intersection with Holt Ave., east of Covina. The top photo was taken in the present day; the bottom one in 1938. 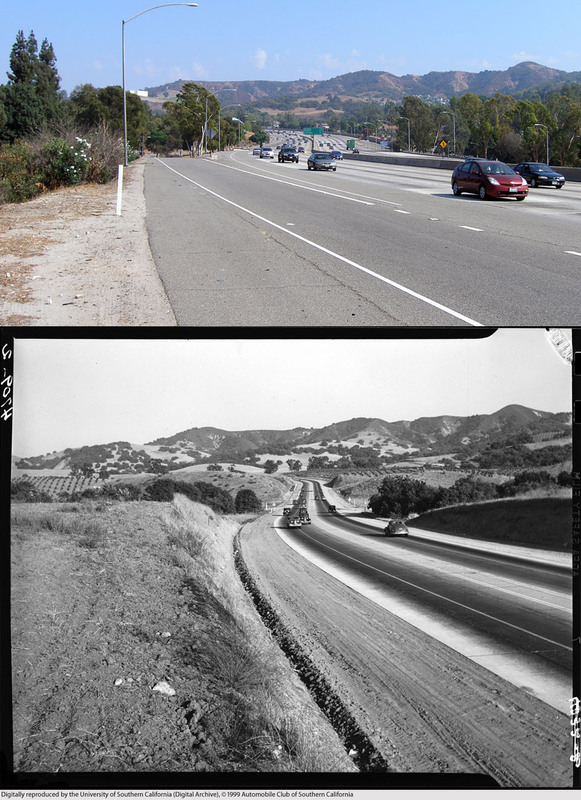 Top photo © 2011 J Scott Shannon, bottom photo © 1999 USC Digital Library/Automobile Club of Southern California.